Jewels (medals) and insignia (badges of office) are fairly common. Tableware, strongboxes and other special artefacts are also known. 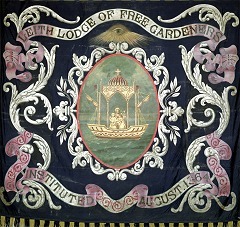 Many lodges bought marching banners. Sometimes trophies survive from the days of gardening competitions. Other artefacts are now known only from photographs, like the bowers and garlands of flowers carried on some parades. Most surviving artefacts date from after 1850. However, Haddington's silver badges were made in 1825-6 and are very distinctive. The fraternity ingeniously symbolised stewardship (or pastoral care) using a watering pan (used to care for fragile plants). 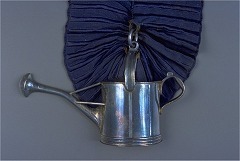 In contrast the medal awarded to Brother James Thomson by the Armadale Lodge of Free Gardeners shows a Masonic heritage. The obverse side is engraved with an open Bible on which is lying a pair of compasses, a setsquare and an open pruning knife, all recognised symbols of the 'Western Grand Lodge of the Scottish Order of Ancient Free Gardeners'. Haddington bought a set of jugs around the same time as they got their badges. These show a gardener taking his ease under a spreading tree as he leans on a spade and reviews the fruits of his labours. Three sizes are known, all in Scots measure - quart, pint and mutchkin. Even their lodge box is decorated with a pineapple. To grow one was a challenge of skill in 18th and 19th century Scotland. Some societies paraded with a costumed character - usually 'Old Adam', but sometimes 'Jock in the Green', who represented their mythology come to life. Other members carried garlands or bowers. Sometimes these were judged in a competition. If a lodge were used to marching it would not feel complete without a giant banner. A few have survived. Most date from the late 19th century or early 20th century, when their style had become fixed. The banners are usually designed to hang from a horizontal pole, held up by two vertical poles. Gardeners' banners are usually blue with painted or embroidered decoration. Much of the decoration is similar to that on aprons - Adam and Eve, Noah, the Ark and a rainbow - but there was usually room for the lodge name, a motto and a different picture on the back.